The South Korean manufacturer has today officially announced brand new models throughout their numerated notebook families including the Series 9, Series 5 and Series 3. All versions will be updated with Intel’s 3rd generation Core ix CPUs and sport discrete Nvidia 6xxM graphics. The Series 5 in particular will include a duo of new models with enhanced JBL speakers and a sub-woofer for improved audio quality. One of the new Series 5 models will be the NP500P4C-S01, a 14-inch notebook sporting a Core i5-3210M CPU, GeForce GT 630M GPU, 1366x768 resolution display, a whopping 8GB RAM and a 500GB HDD. A larger 15.6-inch NP550P4C-T01 will be made available as well, but its larger size will allow it to run on a faster Core i7-3610QM CPU albeit at the same display resolution and Nvidia GPU as its smaller brother. “The power and speed of Intel’s latest processors have enabled us to create even faster, more efficient laptops,” said VP of Samsung’s Business Division Todd Bouman in the press release. All of the updated Samsung models above, including the IVB-equipped Series 9 and Series 3, are expected to be available later this month in the United States. The 14-inch and 15.6-inch Series 5 units will retail for $799 and $899 at launch. As usual, hit the press release below for more detailed information. 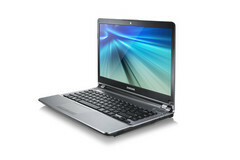 RIDGEFIELD PARK, N.J., JUNE 6, 2012 – Samsung Electronics America, Inc., a subsidiary of Samsung Electronics Co. Ltd, today announced two additions to its mobile PC line: the 15.6-inch Series 5 notebook and the 14-inch Series 5 500 notebook. Both products feature a 3rd generation Intel® Core™ processor and top-of-the-line entertainment features, including JBL® stereo speakers and NVIDIA® GeForce® Graphics. Additionally, Samsung announced that its Series 9, Series 5 and Series 3 models will feature Intel’s new, more powerful processors. 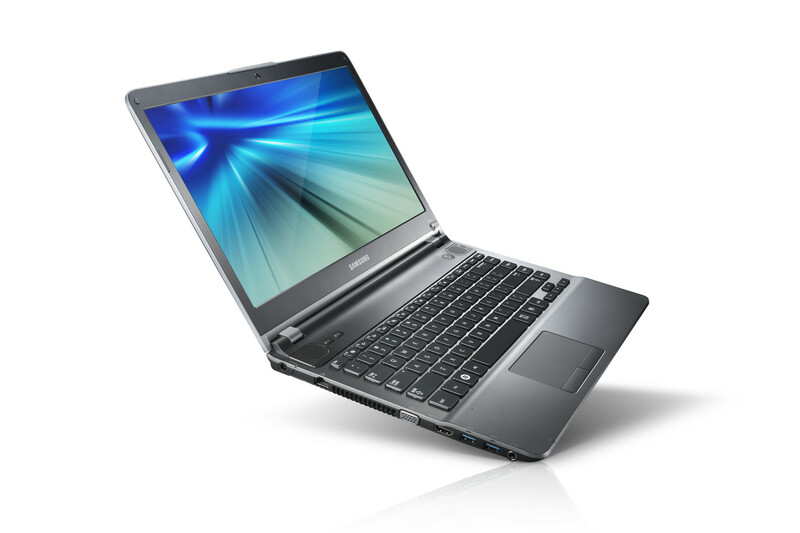 The Series 5 notebook features an Intel® Core™ i7-3610QM processor, which delivers unprecedented speed and performance. Thanks to Intel® Hyper-Threading Technology, users can effortlessly multitask between applications, and Intel® Turbo Boost Technology 2.0.1 gives you an automatic burst of speed whenever you need it – making this a perfect laptop for users looking for a powerful, easily portable solution with a large screen. The new processor, combined with 8GB of RAM and a 750GB HDD, provides the power users need to stay productive everywhere. With the Series 5 notebook’s embedded JBL® 3 speakers and sub-woofer, users will enjoy clear, rich sound, deep bass and great tone articulation – making it an ideal laptop for music lovers and video enthusiasts. SoundAlive technology adds to this premium experience by offering virtual 3D sound, further enhancing the overall sound quality and enabling users to switch between various modes (such as movie mode and music mode) to optimize sound quality for different usage. In order to match this premium audio quality with an unrivalled visual experience, Samsung incorporated NVIDIA® GeForce® GT 630M Graphics into the new Series 5 notebook, which make fast-paced games and videos come alive on the 15.6-inch LED HD 1366x768 screen. The 14-inch Samsung Series 5 500 notebook is an ideal laptop for multi-tasking users, from college students to busy professionals. It features an Intel® Core™ i5-3210M Processor, which delivers high speed right from the start, as well as Intel® Hyper-Threading Technology and Intel® Turbo Boost Technology 2.0.1 for optimal multitasking. 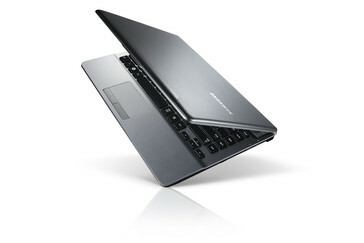 Samsung also incorporated a range of intelligent solutions into the laptop to maximize usability. Tilting legs and a backlit keyboard enable you to comfortably use it anywhere, while a power saving button lets you set the laptop to automatically power down when not in use. Users can also access Samsung EasyShare with just the click of a button, allowing them to effortless share files with friends and colleagues. The 14-inch Series 5 500 notebook also provides the latest advances in multimedia technology. As with the 15.6-inch Series 5, the inclusion of powerful JBL® stereo speakers, a sub-woofer, HD audio processing and NVIDIA® GeForce® GT 630M Graphics offer an unrivaled entertainment experience. The laptop features an LED HD 1366 x 768 resolution display, with Samsung’s slim bezel, giving you the largest screen possible in its small, sleek chassis. This larger screen enables you to easily create presentations, edit photos, watch videos and surf multiple Internet windows without sacrificing portability. Both the 15.6-inch Series 5 notebook and the 14-inch Series 5 500 notebook feature Samsung’s renowned style profile and a patterned silver body. The 15.6-inch product will retail for $899.99 and the 14-inch model will retail for $799.99, both beginning in mid-June 2012. Samsung will also introduce its13.3-inch and 15-inch second-generation Series 9, the 13-inch and 14-inch Series 5 ULTRA and Series 3 laptops with the latest Intel processors beginning in mid-June 2012. The company recently introduced two other laptops featuring 3rd generation Intel processors, the 17-inch Series 7 CHRONOS and Series 7 GAMER, both of which currently available. ** Battery life will vary depending on the product model, configuration, power management settings, applications used, and wireless settings. The maximum capacity of the battery will decrease with time and use. Test results based on independent third party Battery Mark tests. Total amount of available memory may be less based on configuration. Samsung Electronics America, Inc. (SEA), based in Ridgefield Park, NJ, is a subsidiary of Samsung Electronics Co., Ltd. The company markets a broad range of award-winning consumer electronics, information systems, and home appliance products, as well as oversees all of Samsung’s North American operations including Samsung Telecommunications America, LLC, Samsung Semiconductor Inc., Samsung Electronics Canada, Inc. and Samsung Electronics Mexico, Inc. As a result of its commitment to innovation and unique design, the Samsung organization is one of the most decorated brands in the electronics industry. The company was ranked #19 in BusinessWeek/Interbrand “100 Best Global Brands,” and named as one of Fast Company’s “50 Most Innovative Companies of 2010.” For more information, please visit www.samsung.com. You can also Fan Samsung onwww.Facebook.com/SamsungUSA or follow Samsung via Twitter @SamsungTweets. Samsung Electronics Co., Ltd. is a global leader in semiconductor, telecommunication, digital media and digital convergence technologies with 2011 consolidated sales of US$143.1 billion. Employing approximately 206,000 people in 197 offices across 72 countries, the company operates two separate organizations to coordinate its nine independent business units: Digital Media & Communications, comprising Visual Display, Mobile Communications, Telecommunication Systems, Digital Appliances, IT Solutions, and Digital Imaging; and Device Solutions, consisting of Memory, System LSI and LED. Recognized for its industry-leading performance across a range of economic, environmental and social criteria, Samsung Electronics was named the world’s most sustainable technology company in the 2011 Dow Jones Sustainability Index. For more information, please visitwww.samsung.com.